Falkland confirmed their early season status as favourites to win the North East Championship with a convincing seven wicket win against Strathmore at Scroggie Park. Craig McDonald won the toss for the visitors and elected to bat first on what looked like a superb track after the sunshine of the last few weeks. The visitors however were soon in trouble as they lost their first wicket with only 13 on the board as Gary Hewitson chased a wide delivery and Cameron Nellies took a simple catch behind the stumps. 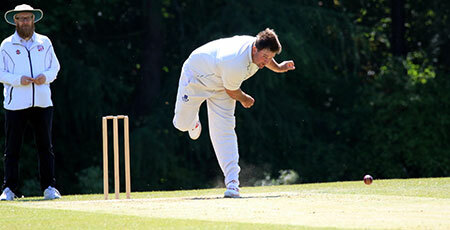 It was the start of a procession of wickets as the Strathie batsmen could not get to grips with the Falkland bowling. Only three of their players reached double figures with overseas player Michael Shum top scoring with 21 as the Forfar side were skittled out for 101 in the twenty seventh over. Ben Strachan was the destroyer in chief finishing with 6 for 19 from his 8.1 overs with Calum Watson and Harsha Cooray chipping in with two wickets each. In reply the home side made light work of chasing down the total reaching their target for the loss of three wickets in the twentieth over. Opener Steven Meikle carried his bat for 44 and Strachan again showed his prowess with a quick fire 20 including a six over long on to win the match. This win sets up Falkland nicely for their trip to Meigle for the semi final of the Village Cup.